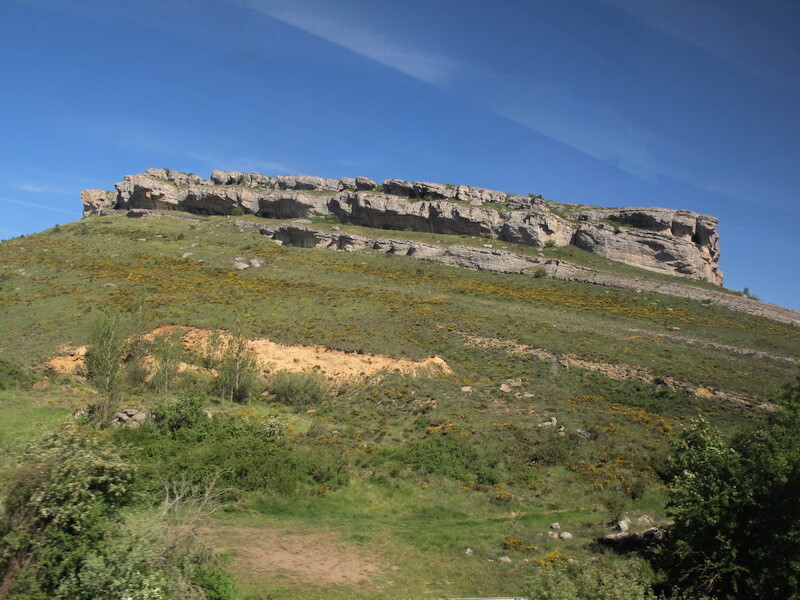 Limestone country to the southeast of Santander as seen out of the train window. 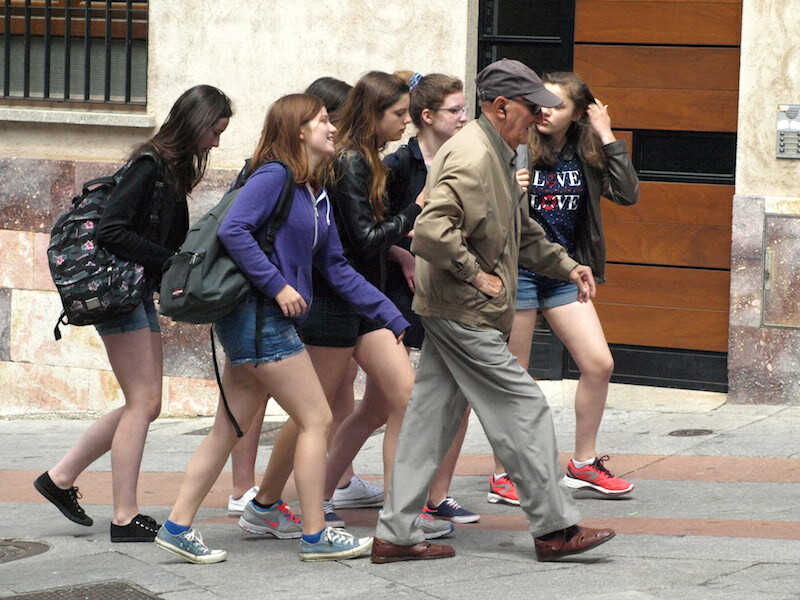 There was no particular reason why we decided to go to Salamanca. We didn’t visit the city in the 1970s, it just happened to be a convenient stopover on the way to Lisbon in Portugal. 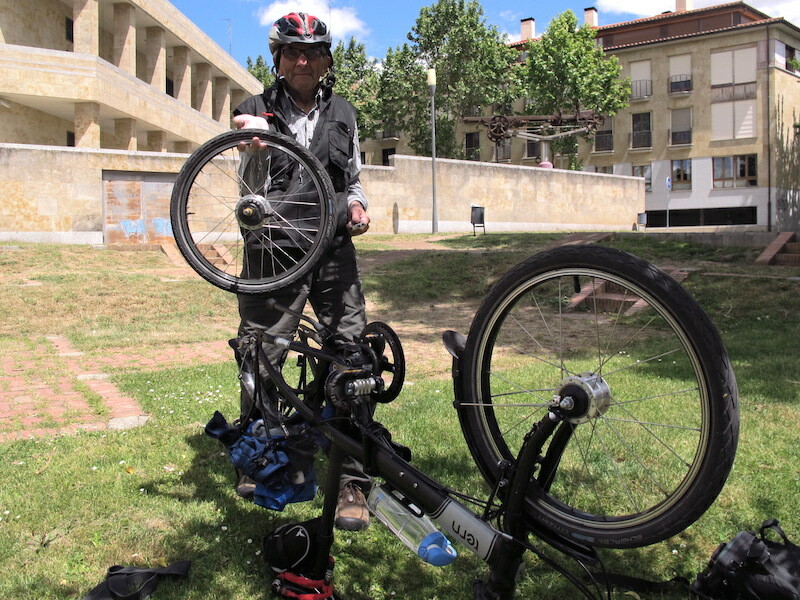 The trip involved changing trains at Valladolid, which presented no problems other than from Valladolid our bikes needed to be in the folded position. Santander to Salamanca map. I have made this map somewhat geographical and botanical. The quaint Formista railway station along the route today. Following are a few more random shots taken from the train en route to Salamanca. Nesting white storks feature first. 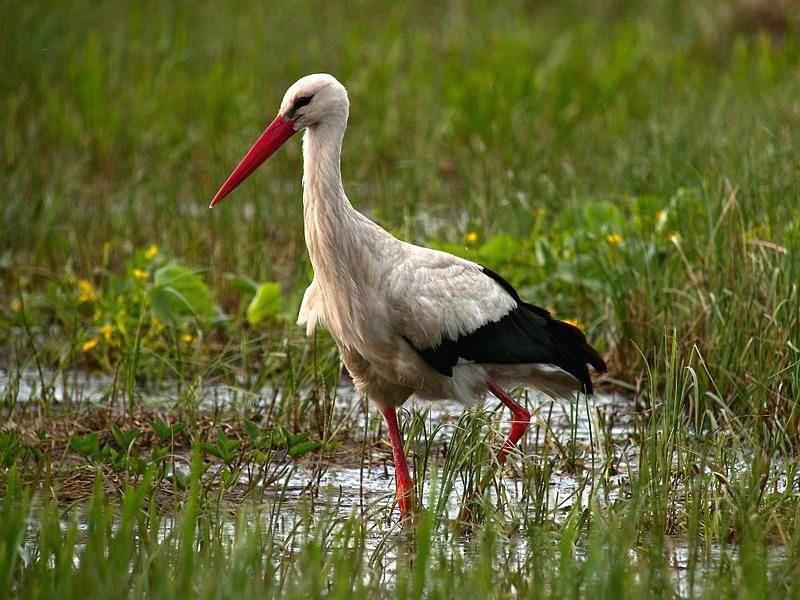 At this time of the year white storks are seen nesting at many locations in Europe and many come to Spain and Portugal. Of course storks once nested in dead trees but there are very few dead trees in Europe these days and I think it’s because when a tree dies it is immediately cut down for firewood. With the dead trees gone the storks have to resort to manmade structures, including houses. 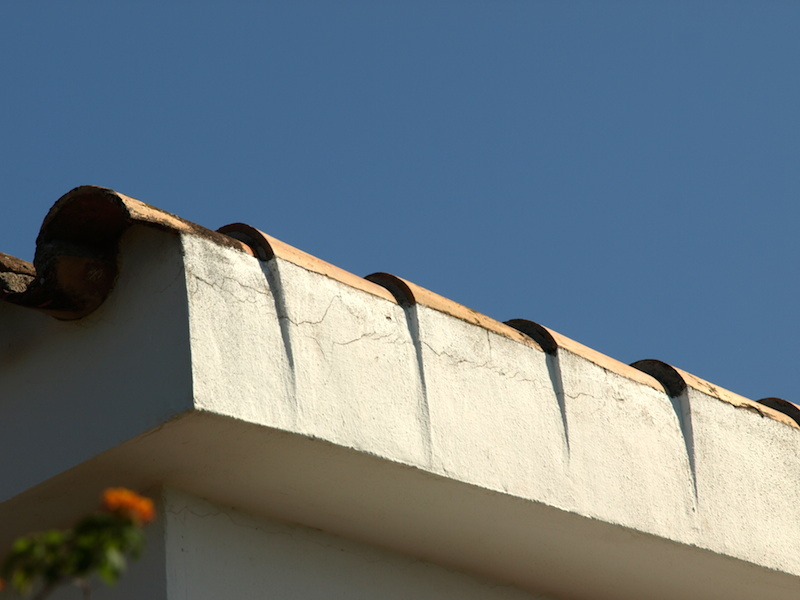 For storks to build a nest on your house was and is still considered an omen of good luck. In Roman times if a stork built a nest on your roof it was seen as a promise of never ending love from Venus. Aristotle considered the killing of storks a crime. 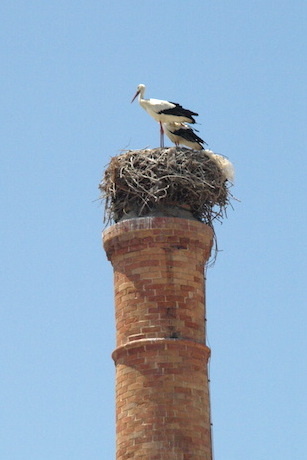 A white stork nest on top of a disused incinerator chimney. The white stork is a long distance migrant, wintering in South Africa and/or the Indian subcontinent. When migrating between southern Africa and Europe, where the majority of breeding takes place, it chooses to cross the Mediterranean Sea at its narrowest point by flying to Morocco and crossing at the Straits of Gibraltar where the waterway is only fifteen kilometres wide. An alternative route where no water crossing is necessary other than the Suez Canal is via the Levant. The reason they do not cross large expanses of water is that thermal currents do not form over large masses of water and it is thermals that the migrating storks rely on to carry them forward. 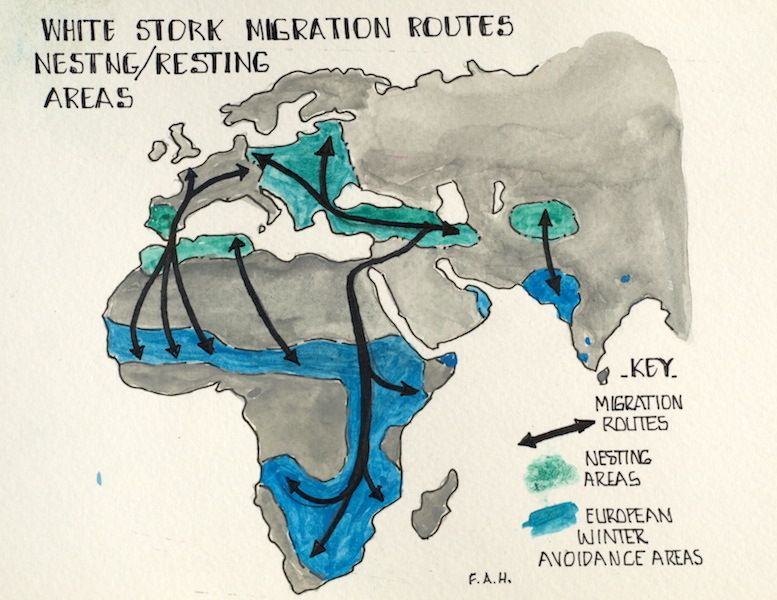 The map below shows the stork migration routes. The Levant is an historical geographical term referring to a large area in the eastern Mediterranean and it includes countries along the eastern shores from Greece to the eastern shores of Libya. White stork in wading mode. Image credit: Frank Vassen from Brussels, Belgium. White storks prefer to forage in meadows where grasses are shorter or in wetlands within five kilometres of their nests. They eat a variety of foods ranging from insects, earthworms, reptiles and amphibians. Frogs are high on their list of desirable tucker. They will also take larger animals such as moles, voles, shrews, young birds and fish. The draining and filling of wetlands for agricultural, housing and industrial use has greatly affected the population of storks, their feeding grounds have simply disappeared. A feature of a stork survival is they have the habit of defecating onto their legs. The faeces stick and then the urine in the faeces evaporates, helping to keep the bird cool. The process is called urohidrosis. 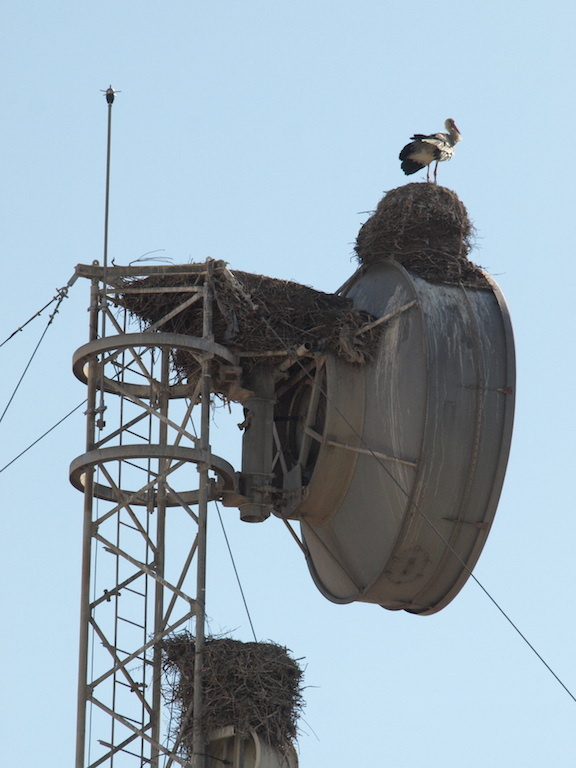 Storks nesting on top of a parabolic communications disc. 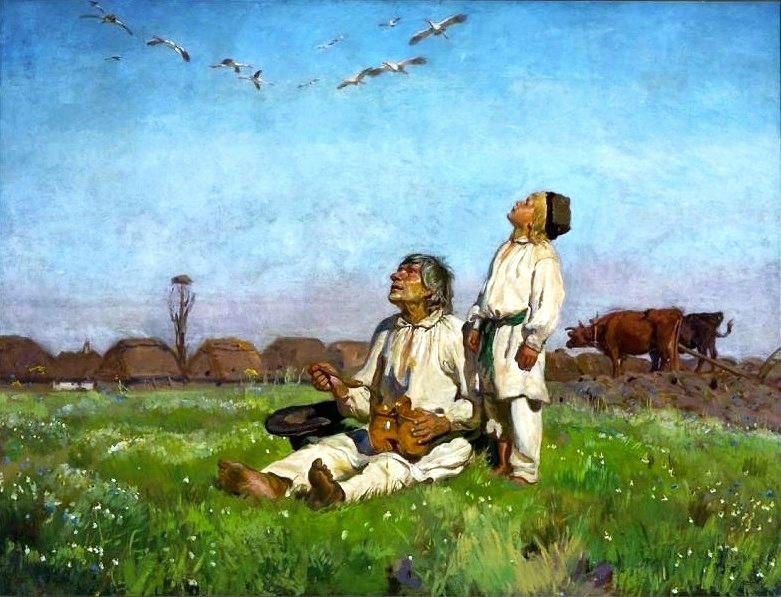 Bociany (Storks), a painting by Jozef Chelmonski (1849-1914). Image credit: taken from Wikipedia who consider the image in the public domain. The father in the above painting may be telling his son where babies come from. The myth that storks brought babies into the home relates to the fact that they had easy access to chimneys and they could come down like Santa. Note the stork nest in the tree on the far horizon of the painting. Both the male and female share the raising of the young and in most cases are monogamous. They return to the same nest every year. The males arrive in the nesting region first, maybe to do a spot of housekeeping, and the females follow soon after. White storks can live to the ripe old age of thirty, the oldest recorded after tagging was thirty-nine years. 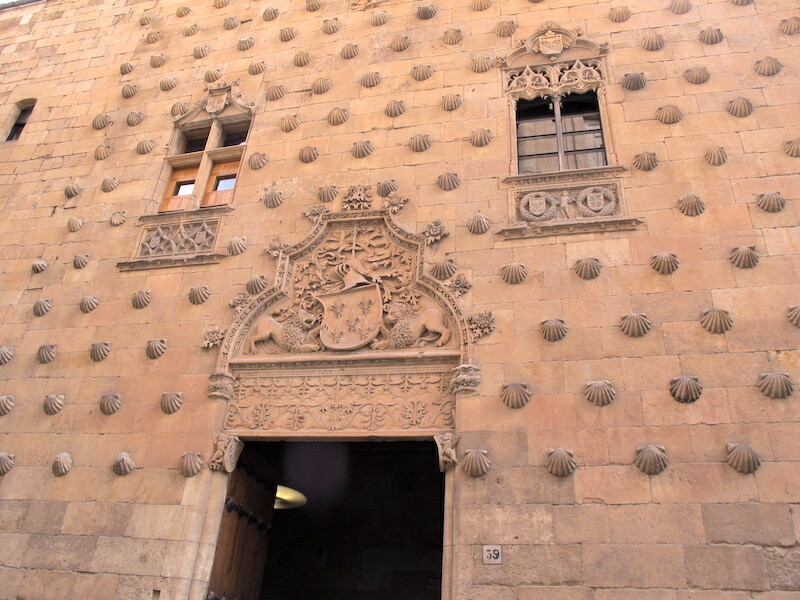 SALAMANCA: Salamanca has a population of just over two hundred thousand and a big proportion, some thirty thousand, are Spanish and foreign university students. 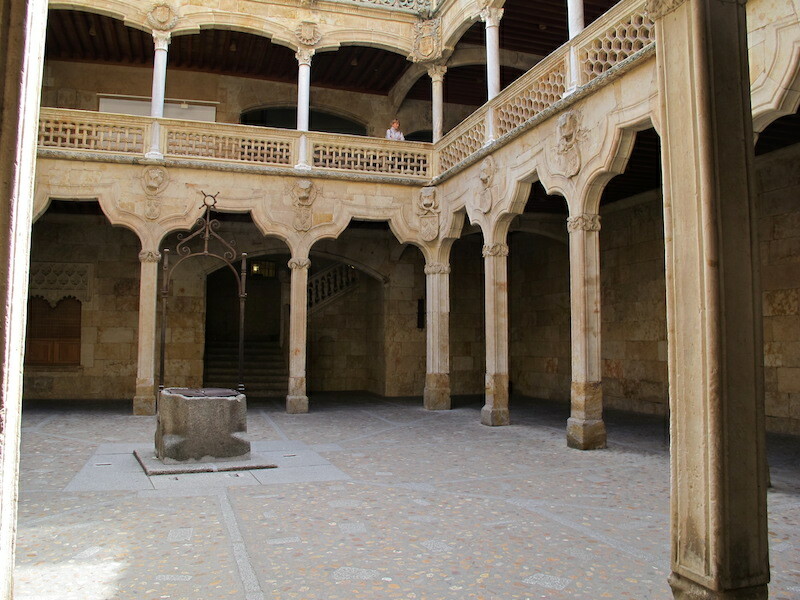 The university was founded in 1134, making it the oldest university in Spain and the fourth oldest European university in continuous operation. It is easy to imagine that in its 811 years of operation there has been a lot of academic talk within its walls. One important discussion related to the feasibility and effects of Christopher Columbus’ world exploration proposal and the associated effects on the indigenous people of the lands the Spanish claimed. Discussing indigenous rights was unheard of at the time. In many ways the university looks more like a monastic establishment. There are monasteries, churches and a cathedral standing wall to wall with the lecture halls, there is no demarcation between monastic buildings and the place of learning. The architecture within the old town is overwhelming and taking photographs and presenting them here with a simple caption does not do the buildings justice. One really has to be on the spot to gaze up and let the buildings and their adornments envelop you. The magnitude of the ancient buildings is overwhelming. 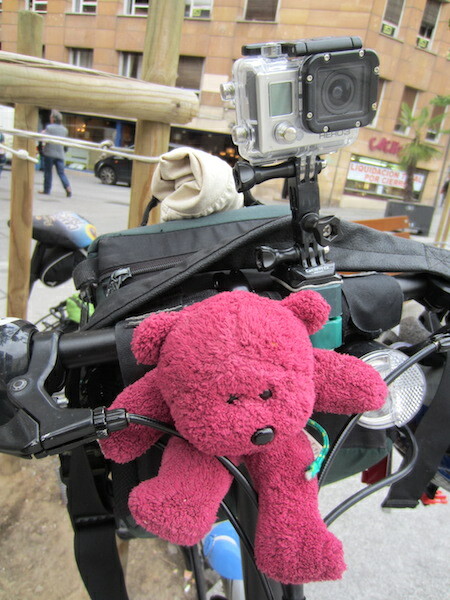 BBear securely strapped onto the handlebars of my bike ready to explore Salamanca. Above BBear is a GoPro camera ready to record the events. 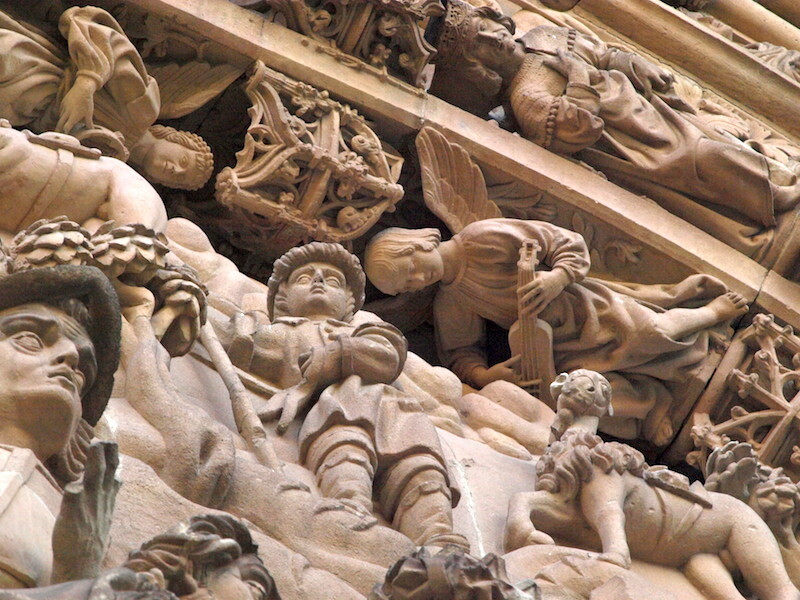 Following is a series of photographs taken in Salamanca showing its centuries’ old magnificence. 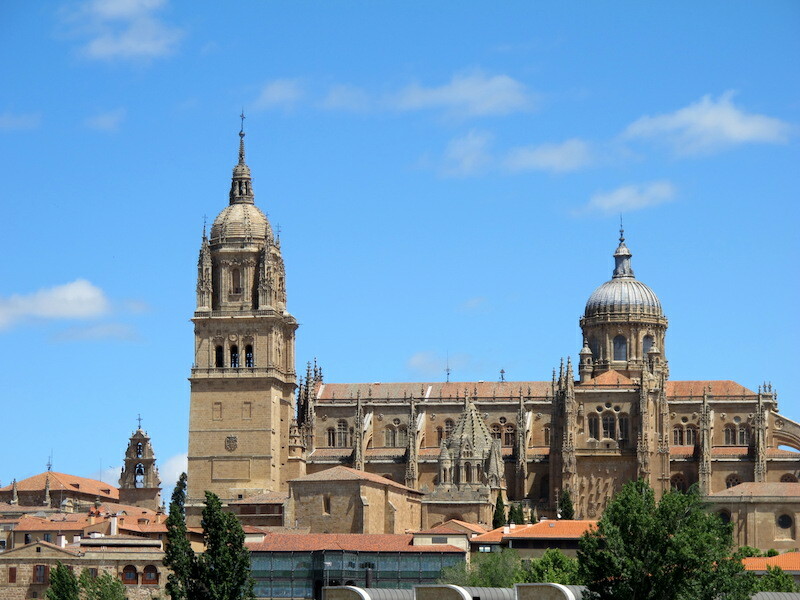 Salamanca’s cathedrals. The two towers do not belong to the same church: one is the New Cathedral and the other the tower of the Old Cathedral. Closeup view of the Old Cathedral tower. The Old Cathedral is in the Romanesque style. Semi-circular arches characterized the Romanesque era. There is no agreement for the beginning date of the style. Proposals range from the 6th to the 10th centuries. 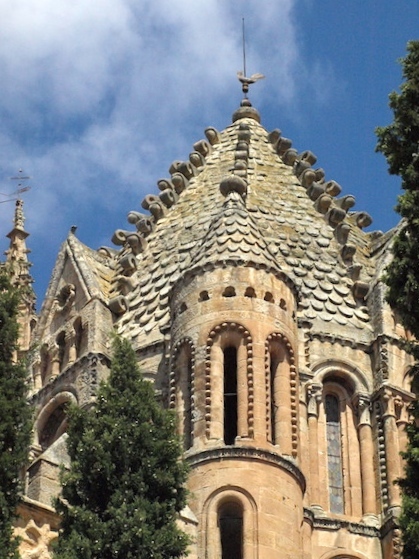 It developed into the Gothic style in the 12th century. The Gothic style includes the pointed arch, ribbed vault and the flying buttress. Many of the great cathedrals, abbeys, palaces, town halls and universities of Europe are built in the Gothic style. If I was asked which style I prefer I would have to lean towards the Gothic. The Romanesque is bordering on Baroque, a style I am not fond of at all, it’s far too busy for my liking. An interesting point is that a modern sculpture has crept into the Old Cathedral. There is a 20th century image of an astronaut. No one knows how it got there, however it is surmised that an anonymous sculptor did it during restorations not so long ago. 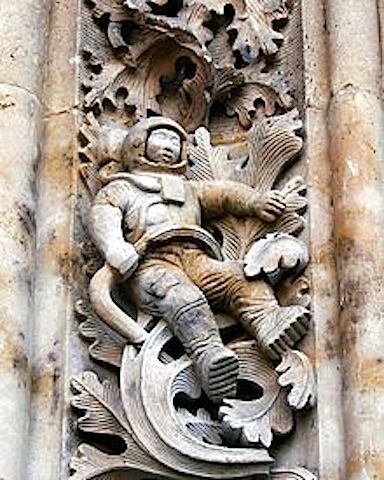 We couldn’t find the astronaut so I have borrowed an image from Wikipedia. The astronaut added during restorations. 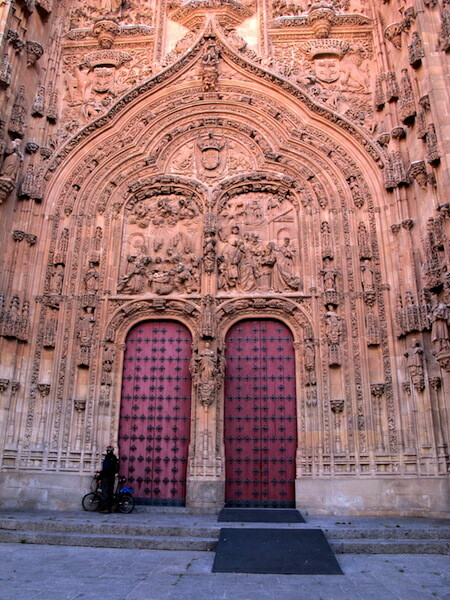 Entrance to the New Cathedral built in the 16th century. The sandstone statues up on high all seemed to look down in judgment. The following images show the remarkable detail and I cannot comprehend the organization and the work involved to produce such a beautiful piece of artwork. 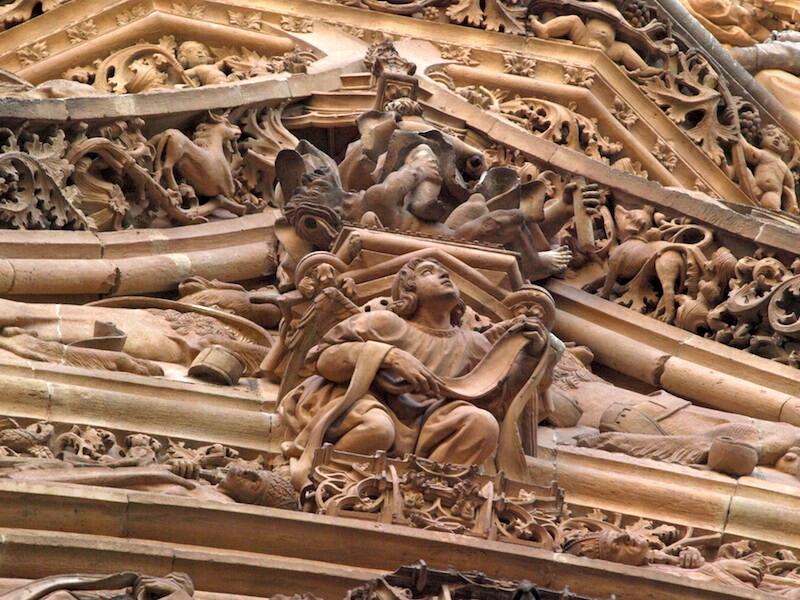 Look at the complexity of the carvings. Enlarge the image and have a closer look. The Virgin Mary and baby Jesus. Faces of the 16th century, most have grief-stricken looks. 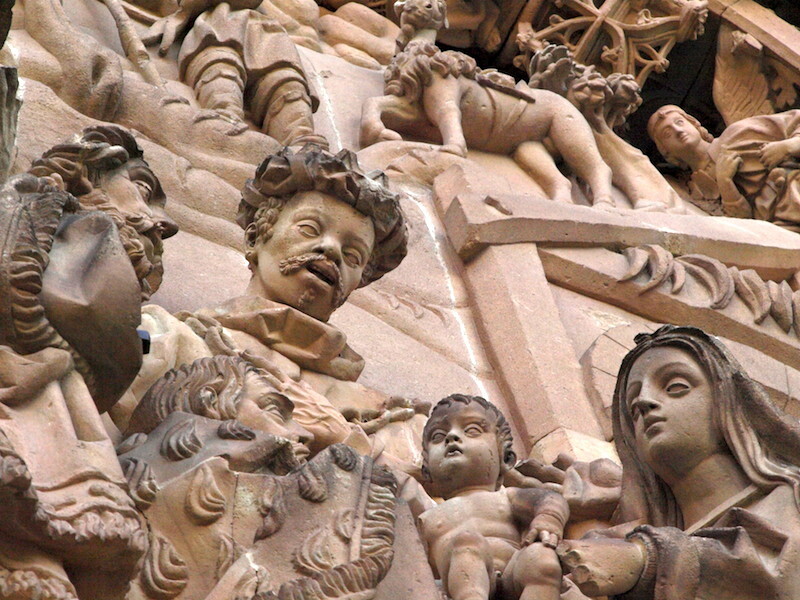 Imagine the sculptor who carved these images returning home at day’s end and in reply to his wife who asks him about his day says, ‘I managed to finish another baby Jesus finger today. At the rate I’m going I should have the baby Jesus finished by this time next year’! The images on the facade of the new Cathedral certainly got me to thinking. I tried to come up with a logical explanation regarding what they meant to people at the time of creation. All I could come up with was for the believers the images were symbols of hope and the creators endowment of Peace on Earth, Eternal Life and if you rejected God you were heading for a life of damnation. I’m not saying my prayers but using my bike seat as a tripod. The morning we rode around Salamanca old town a cold wind was blowing so at every opportunity we sought spots out of the wind. A warm spot was in the courtyard of the Biblioteca Publica, the public library. I do like the mixture of upper and lower case lettering. It has a certain creative style about it. 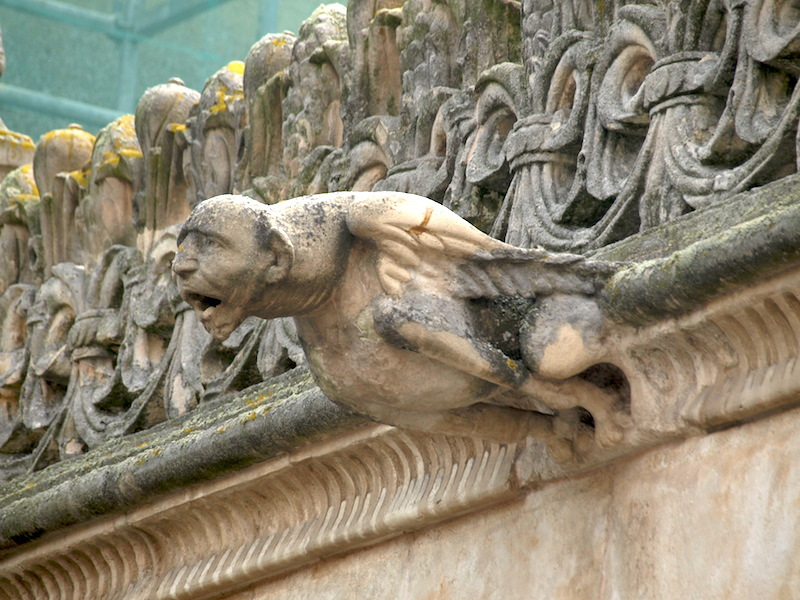 Up high, surrounding the courtyard, were a number of nasty looking gargoyles (water spouts). I dealt extensively with gargoyles in the post St Gallen Switzerland in Odyssey#2 but just to refresh, gargoyles were deliberately made to look ugly in an attempt to keep evil spirits at bay. A plucked turkey with a human head, a frightening thought indeed. 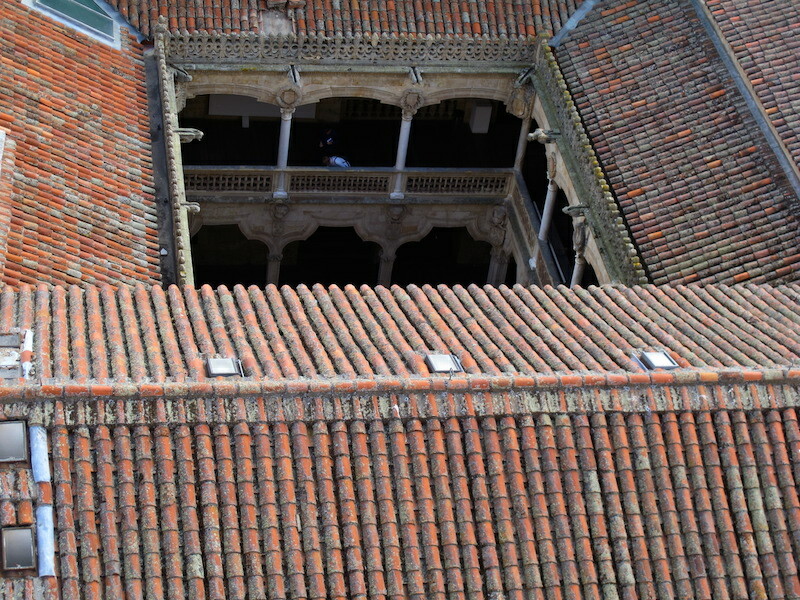 The courtyard of the Biblioteca Publica as seen from the university tower. 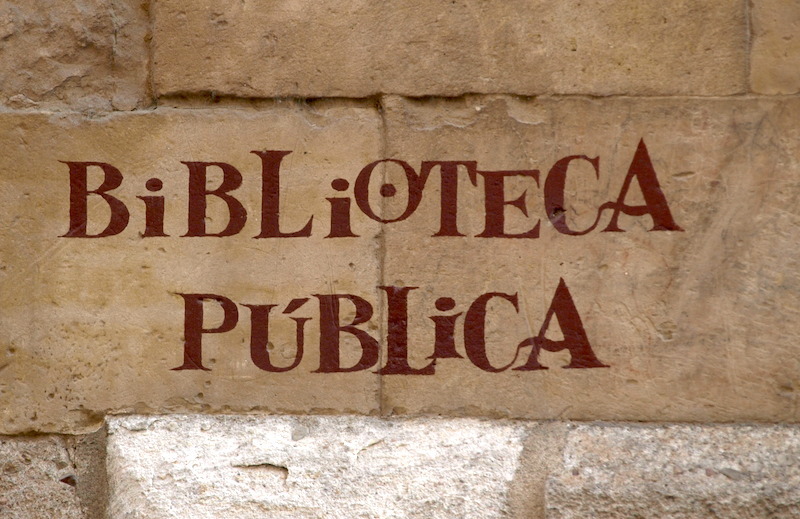 Within the biblioteca courtyard. Note the well in the middle and the intricate carved stone handrail. 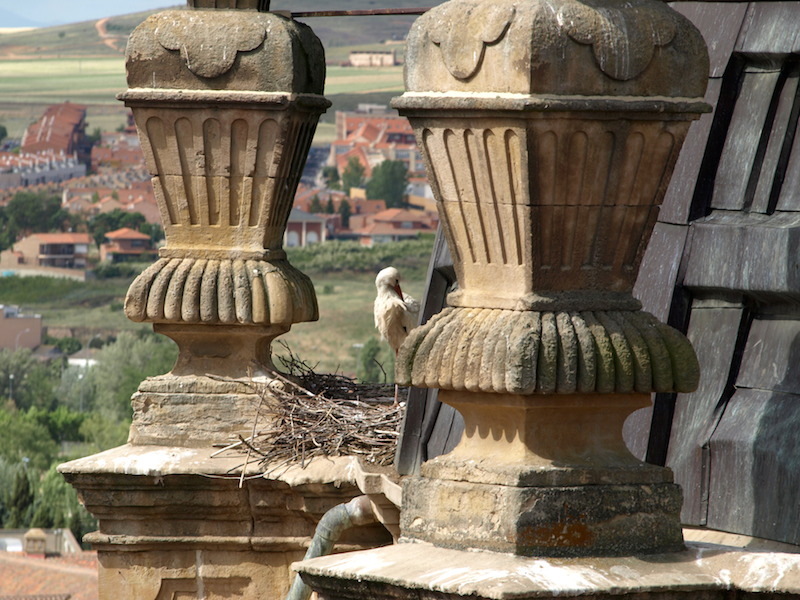 Fortunately on the morning we were mooching around Salamanca old town we were able to climb to the top of the university tower and storks were nesting on the church tower opposite. 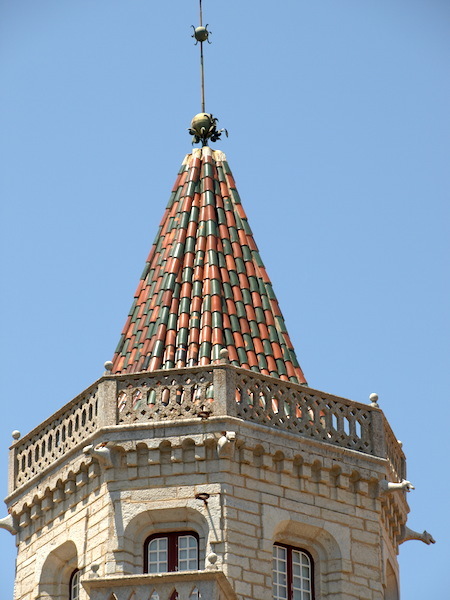 Ornate adornments on top of the tower, ideal places for white storks to nest. 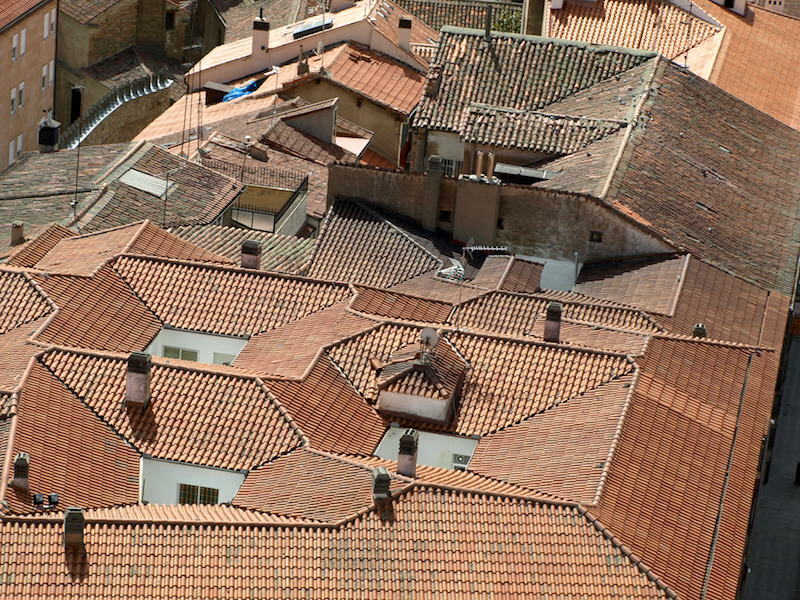 The view from on top was vast but what interested me was the sea of complex and multi angular mission and Roman tile roofs. Mission tiles, sometimes called barrel-vaulted tiles, are semi-circular and laid over each other alternatively, one up and one down. This shape and method of laying has been around since ancient Greek times. 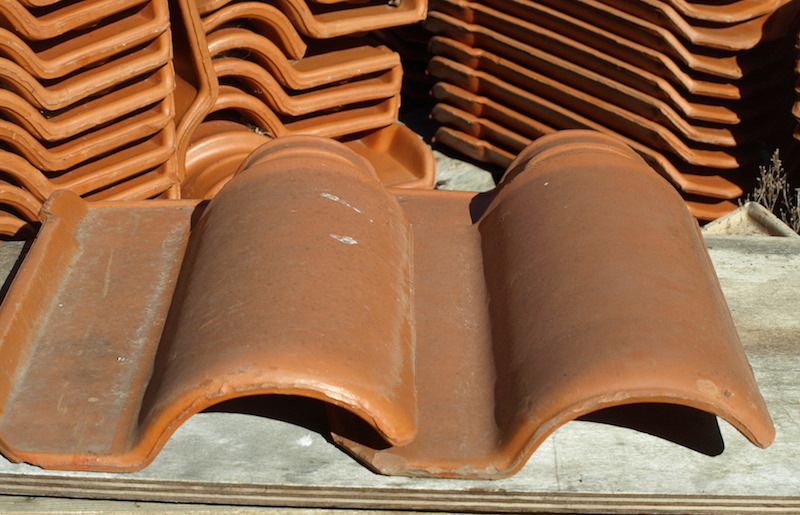 The tile shape was originally shaped by forming a flat slab of terracotta clay around a log. Of course they are machine-made and mass-produced today. Example of a mission tile arrangement, one up one down. 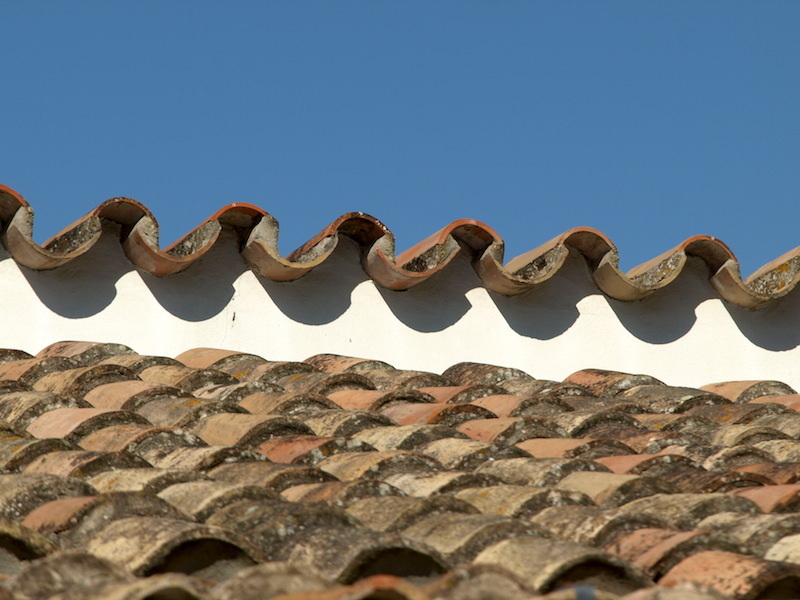 The tiles are bonded with a sand and cement mix . A very professional barge ending on a mission tile roof. 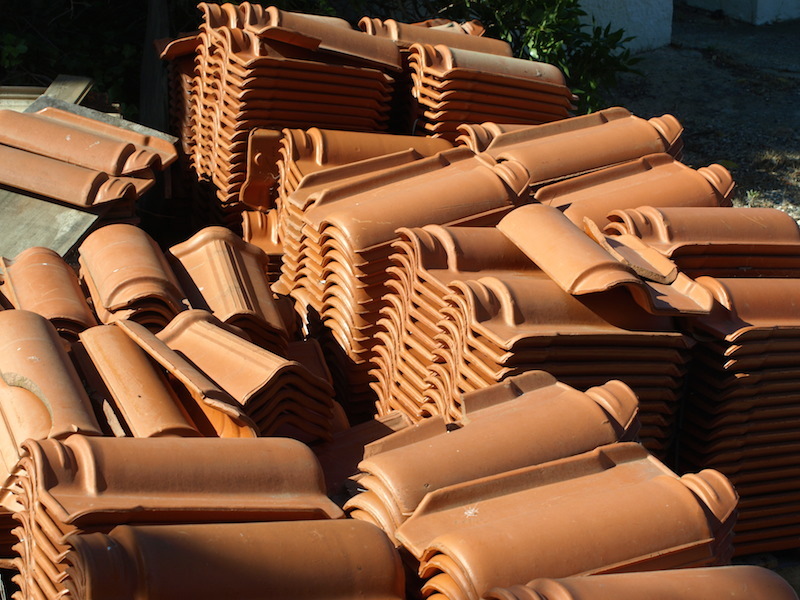 A heap of modern Roman tiles. Roman tiles go together a little differently to mission tiles. Roman tiles join like this. Glazed mission tiles in the vertical. Some very accurate cutting was involved here to accommodate the tapered spire. BACK TO THE UNIVERSITY TOWER: Access to the tower was up a narrow spiral staircase and because space at the top was limited there were two attendants on hand ensuring only a certain number of people were up the tower at one time. Whilst waiting our turn to go up one of the attendants, Jose, asked us where we were from and after informing him about our Encountering the Past experiences I commented on how good his English was and asked whether he studied English at school. He replied that he taught himself long after leaving school by reading the book Papillon. Now, if the readers of this blog have been keeping up and they read the London post I spoke extensively about the Papillon breed of dog and the book Papillon when writing about the Wanstead dog show. The coincidence is amazing as it was only this week I finished and posted the dog show story. What are the odds that I wrote about the book Papillon and then met the attendant who learned English by reading the book? Image from Amazon Book catalogue. 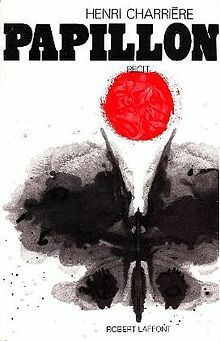 The author Henri Charriere was called Papillon for the butterfly tattoo on his chest. He was convicted in Paris in 1931 of a murder he didn’t commit and was sentenced to life imprisonment in the penal colony of French Guiana. He became obsessed with one goal: escape. If you haven’t read the tale, do so. It is a great read and apparently a good way to improve or learn English. 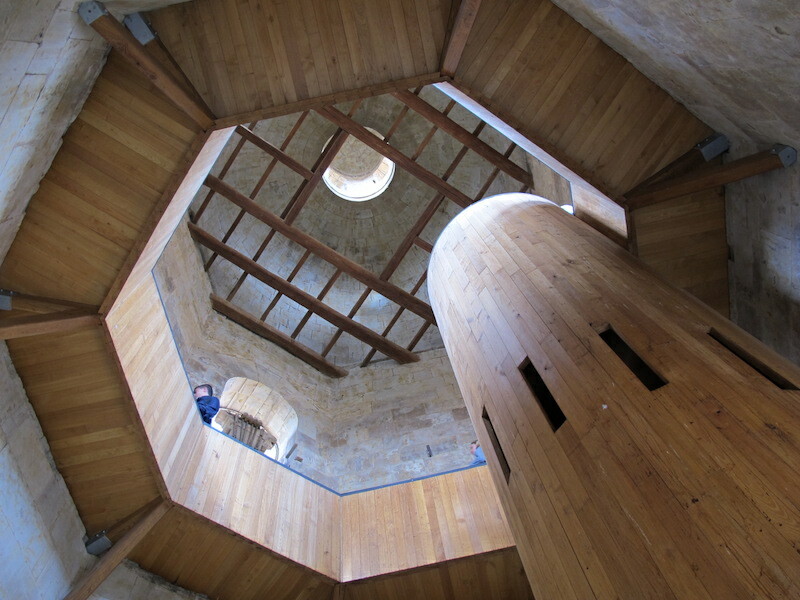 Enclosed narrow staircase to the tower top. SALAMANCA WORLD HERITAGE SITE: In 1988 the old part of Salamanca was declared a World Heritage Site and thus many of the old buildings have had or are having restoration work carried out on them so as to maintain the WHS status. 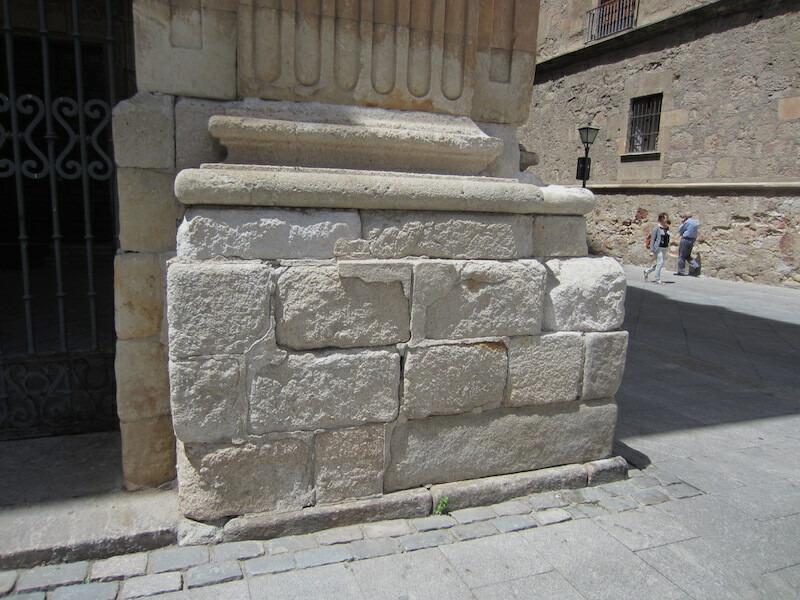 Restoration of old stone buildings is a tricky business, especially in Salamanca, as many of the buildings were made from Villamayor sandstone, a rather soft rock, easily carved but adversely affected by the weather. Following are a few images showing the weathering of soft sandstone. Erosion of the sandstone pedestal and quoins can be clearly seen here. The keen observer will notice that in most cases erosion is more severe closer to footpath level. This is because wind borne sand-sized particles are swept off the footpath and they in effect sand blast the lower portions of the walls. Serious erosion down low. It is no simple matter restoring this wall to its original condition. 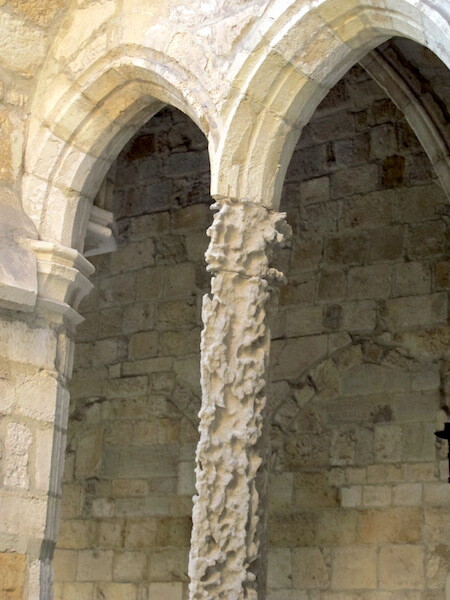 Very serious church column erosion, Santander. It will be a test for the masons when they go to replace this column. Firstly, jacks will need to be put under the arches and then the old column removed and a new one slid in. I expect there will be a certain amount of breath holding during the operation. Out of the old town the architecture is modern and conventional, basically large boxes, mostly I’m sure to house the thousands of university students who live there. To our displeasure we managed to get lost and after conflicting directions we finally found the bike path which runs along the river’s edge. My advice to pending cyclists is to not deviate off the bike paths. We did and managed a flat tyre. 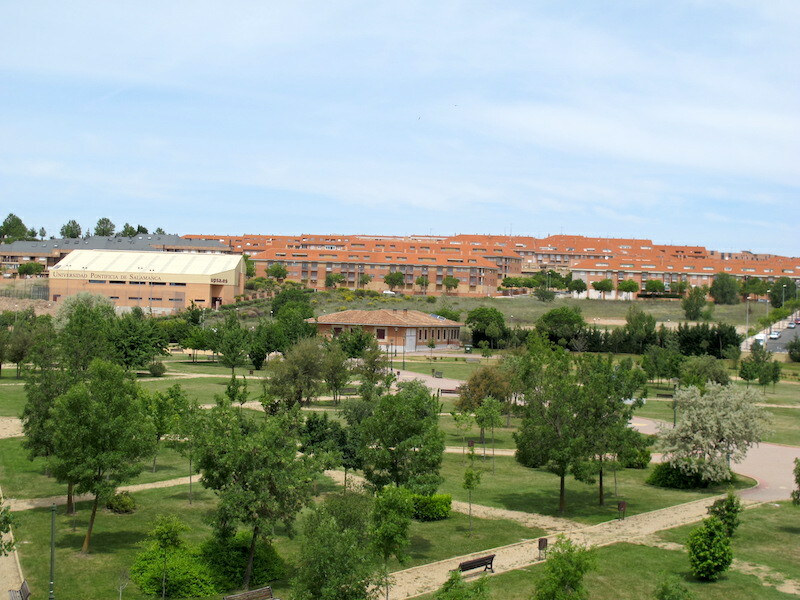 The bland apartment buildings of Salamanca. 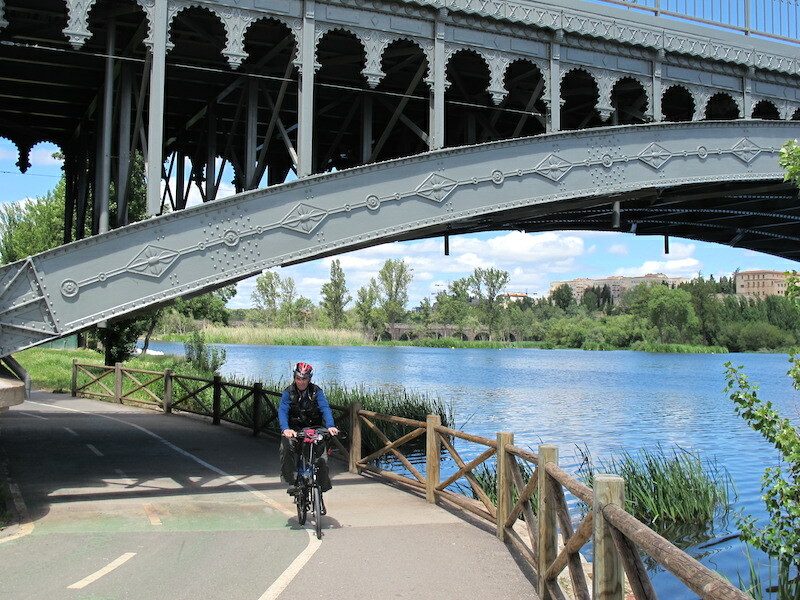 Coming under one of the bridges over the Tormes River. The wheel off and getting ready to effect repairs. The hazards of getting off the bike paths or the well-beaten tracks. I kept both the items shown in the above photograph as you never know when you might want a piece of soft wire. The screw will travel back to Australia. 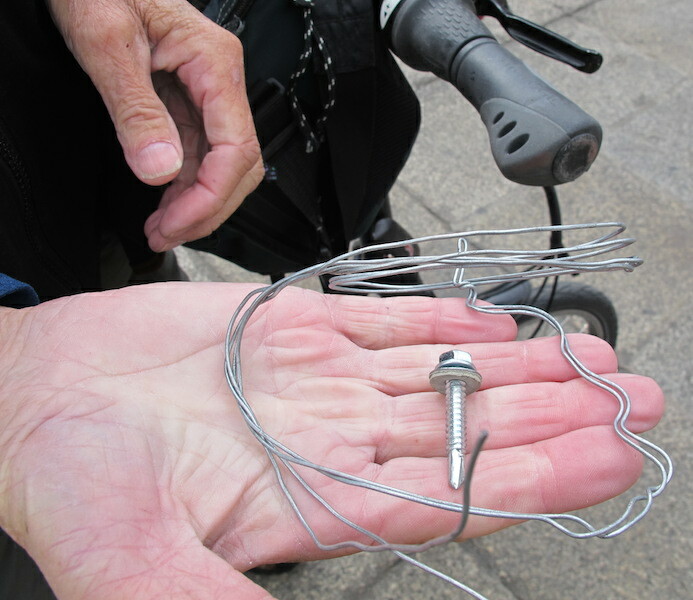 I never pass over a screw, nut, bolt, nail or washer and when I have used them years later I can recall where I picked them up. You are now convinced I am an eccentric. It’s ok, I don’t mind. 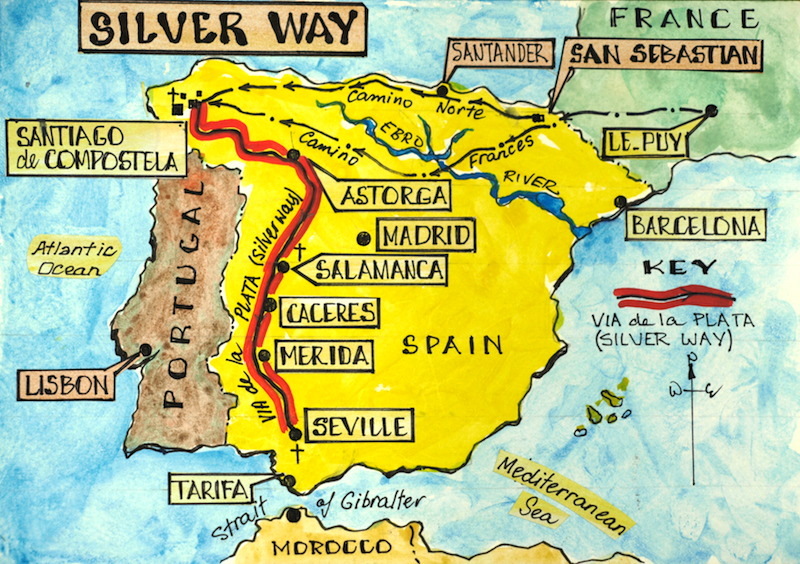 THE SILVER WAY PILGRIMAGE ROUTE: There are many pilgrimage ways in Spain and Portugal, some emanating form locations in France. There is one that goes from Seville in southern Spain to Santiago de Compostela in the northwest above the northern boundary of Portugal. 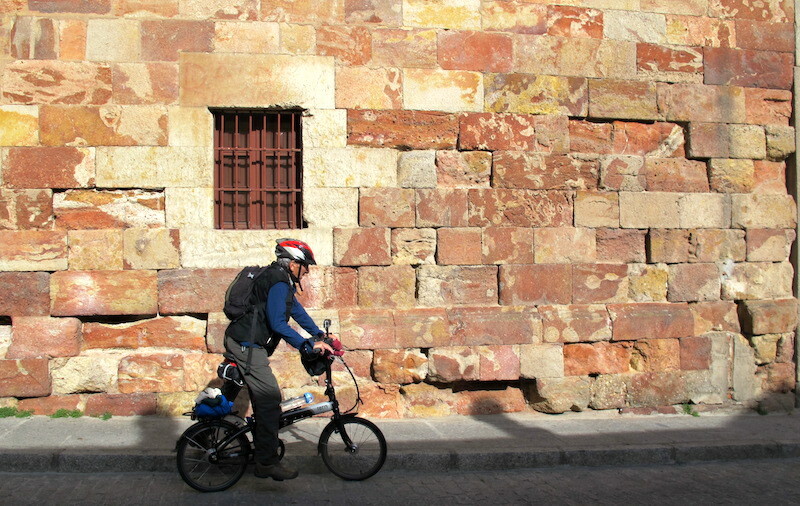 Salamanca is about the halfway point. The Via de la Plata was so named because it follows an old Roman road along which silver was transported. Today we spotted a few of the tens of thousands of people who walk the route every year. 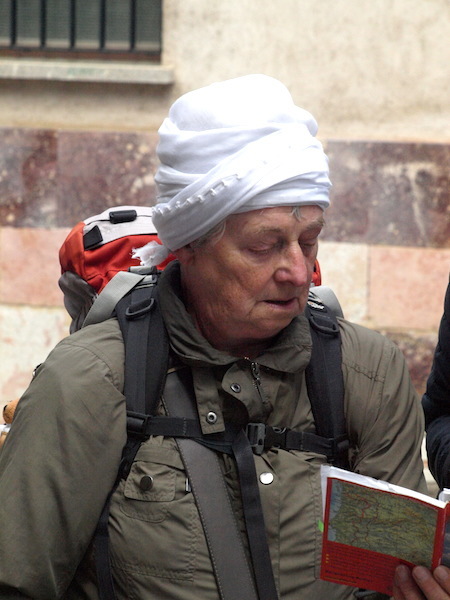 One of the many pilgrims on the way along the Via de la Plata. Checking which way to go. Unfortunately we couldn’t talk at length to this walker as she did not speak English and we couldn’t speak French. 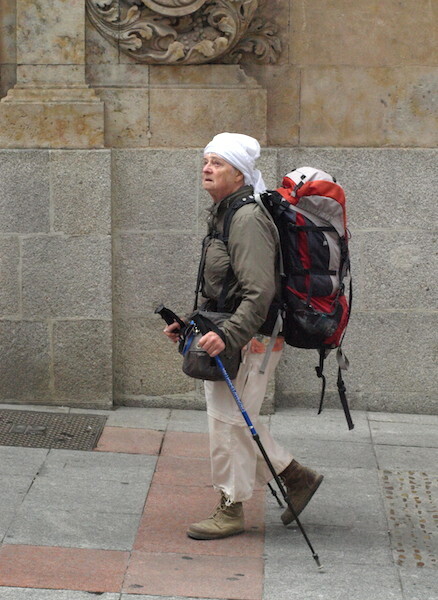 A number of the walkers we saw had a scallop shell hanging from their pack because it is a symbol of the Camino (road or path) de Santiago. The shell has taken on a mythical and metaphorical meaning and so pilgrims walking the way collect one as a souvenir if they are not given one at the start of their walk. Scallops on the wall of the Shell House in Salamanca. It was once a private house and now it is a library. At this point there are a couple of vexing questions. Why do people take to walking up to a thousand kilometres along these paths and why are they heading for Santiago de Compostela? There are a number of reasons which could include: an exciting and challenging walk, a kind of life test, walking it is something that has to be done as an act of faith (a little like all Muslims who try to visit Mecca once in their lifetime). 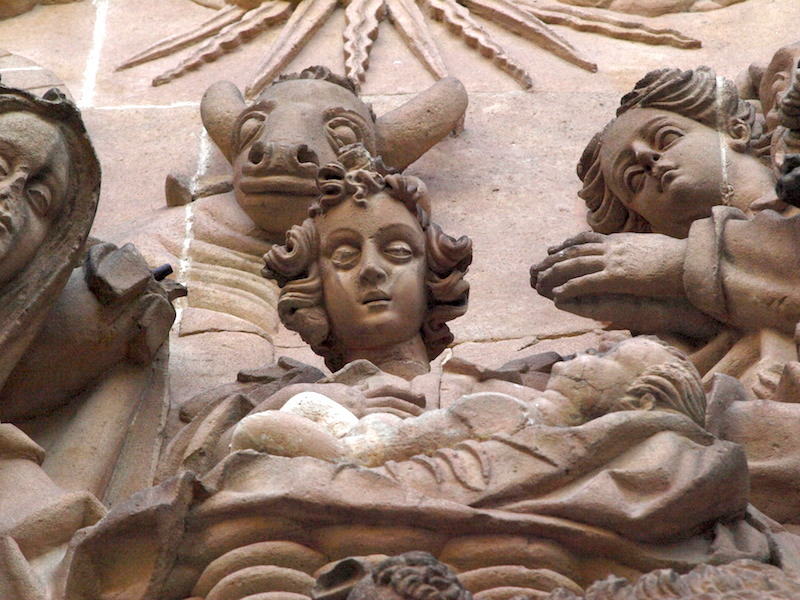 The faith aspect relates to the fact that Saint James when preaching on the Iberian Peninsula near the town of Zaragoza on the Ebro River saw a vision of the Virgin Mary. After having the apparition he returned to Judaea to tell the world. Unfortunately whist there he was condemned to death and as a result it is thought he became the first Christian martyr. After his death his body was taken back to Spain for burial on the west coast near the area now known as Santiago de Compostela. There are number of versions relating to how the body of Saint James was actually transported. The most often quoted version indicates that his body was taken back by ship but a big storm hit the ship and the body was lost to the ocean. However, after some time the body washed ashore undamaged and was covered with scallops, hence the scallop shell connection for all the walks, known as the Way of St James. 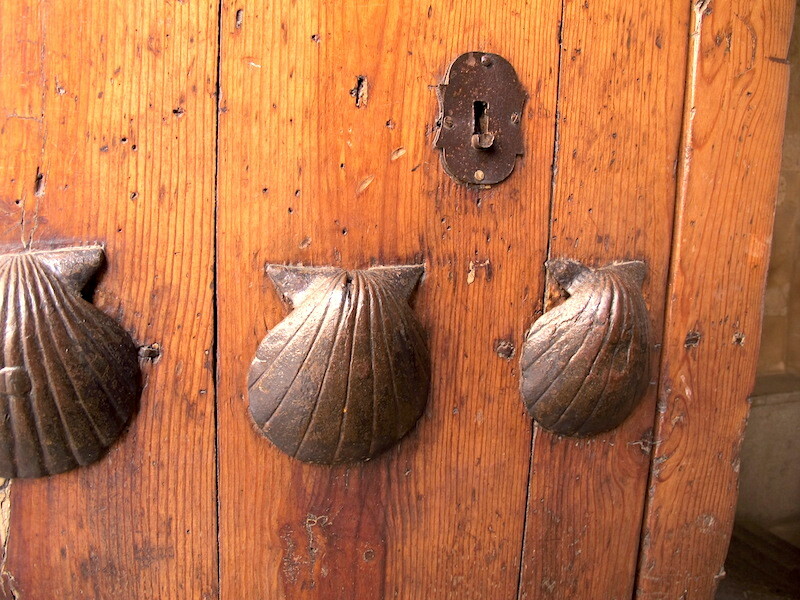 Scallop shell symbols on an old door. For walkers the scallop shell acts as a metaphor. The grooves in the shell run from the outer edge and meet at a central point, each groove representing the routes travelled to arrive at the tomb of Saint James. The scallop shell also had practical applications; it was the right size to use as a drinking vessel and as a spoon when eating from a bowl. These days, much to the pleasure of those selling accommodation, food and other necessary items walkers need, the walk has become very popular. More than 270,000 pilgrims made the trip along the Silver Way during 2010. It would no doubt be rewarding walking the Silver Way but for us at the moment the only way is the bike pathway. 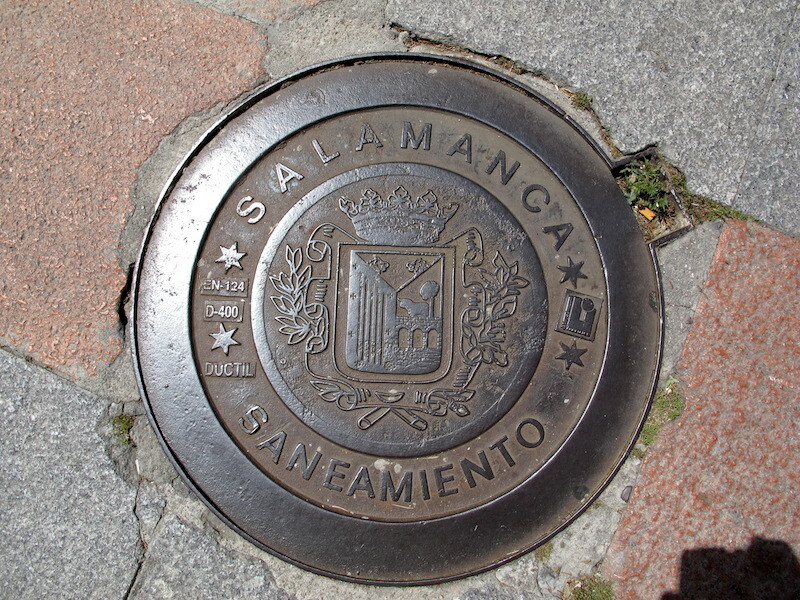 However there is one problem riding the bike pathways and that is we have to stop frequently to look at things, for example the beautiful ornate man hole covers which we pass over. Correction…Access hole covers. Sometimes we deliberately ride over access hole covers because they clink musically as you go over them if they are loose. Loose pavers also clink and unless on a bike you would never know the sounds of the path. It is impossible to let this cast iron creation slip under the wheels without stopping and having a look. I believe that many bike pathways are laid down over sewage pipeline easements and hence the access covers. 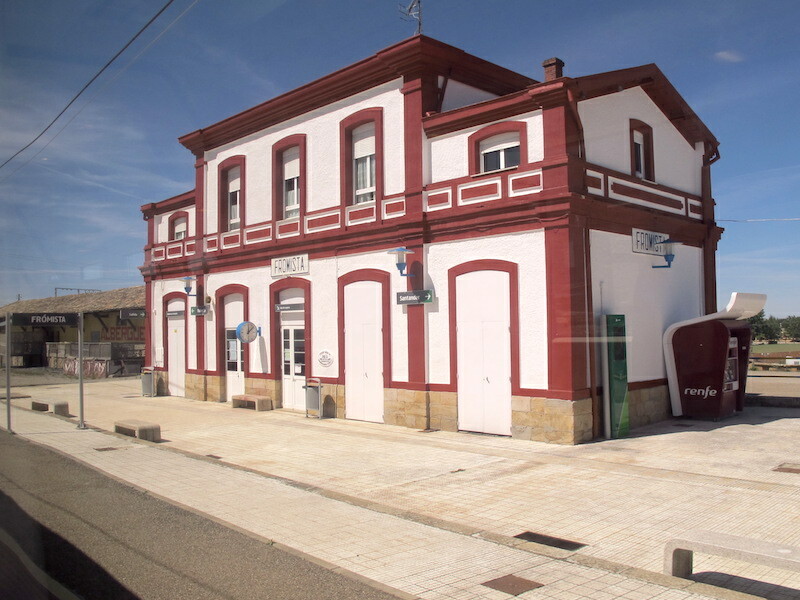 Finally, before closing this post, a few images taken near the Alda Centro Salamanca Hostel where we stayed and a story relating to the difficulties we experienced getting into the hostel the day we arrived. The term hostel does not mean a place where people are sleeping in close proximity. I think the word is used to imply budget accommodation. The room we had at Alda Centro had an ensuite, we had access to a kitchen and a spacious dining and lounge area and the girl who looked after us was friendly and helpful. When we arrived at the hostel a code was needed to open the door. We obviously didn’t have the right code so couldn’t enter. We found out later that the door code had been emailed that day but we didn’t have access to the internet. We sat on the step thinking, what next? Do we go off and look for another place or wait until someone turns up? Next door to the hostel was a travel agent so I asked would they mind telephoning the contact number on the booking confirmation. Bev then spoke to Gloria who gave her numbers and codes and we were in. It is common for some hostels to not have a 24 hour service desk, you let yourself into your room via coded locks. It’s a good system as it keeps costs down which the money-cautious traveller needs. Usually a check-in person turns up by mid afternoon. Next day I bought a flowering cactus and gave it to the travel agent lady as a gift of appreciation. 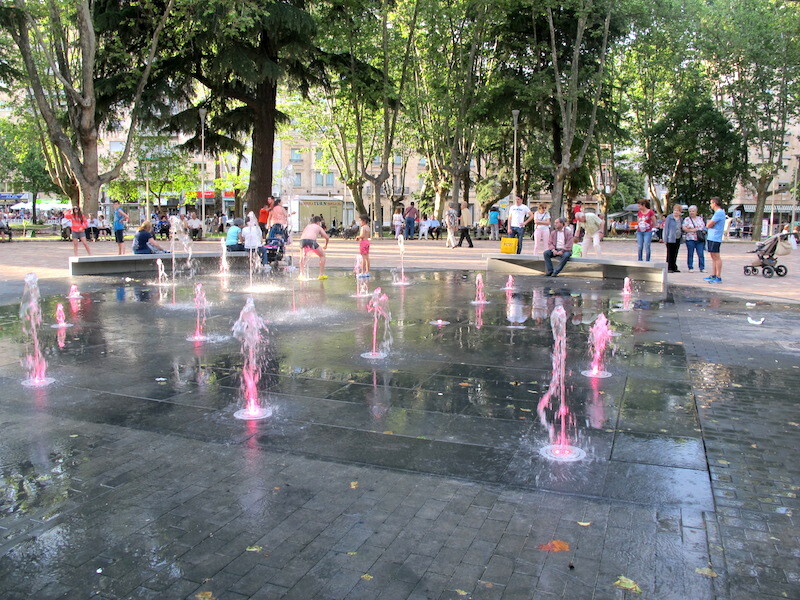 Colourful water fountains in the park opposite the hostel. Kids delighted in running through the waterspouts. Afternoon shadows. Promenading and sitting in the late afternoon sun and chatting is an important activity. 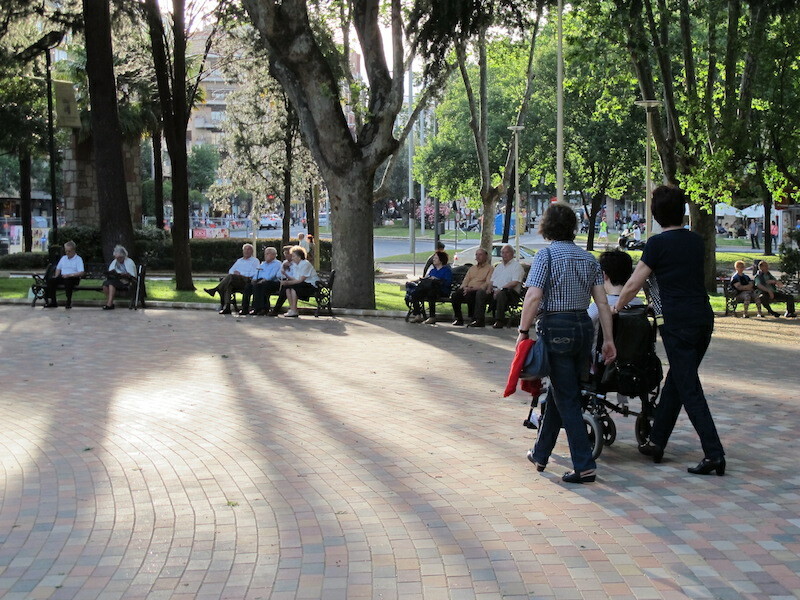 In Spain, and Europe generally, because high density apartment living is the norm, coming out in the late afternoon into the park is a common social activity. When we walk through the worn and degraded parklands in some parts of Europe we think of home and how lucky we are to have natural bushlands around us with wonderful birds and native animals right on our doorstep. 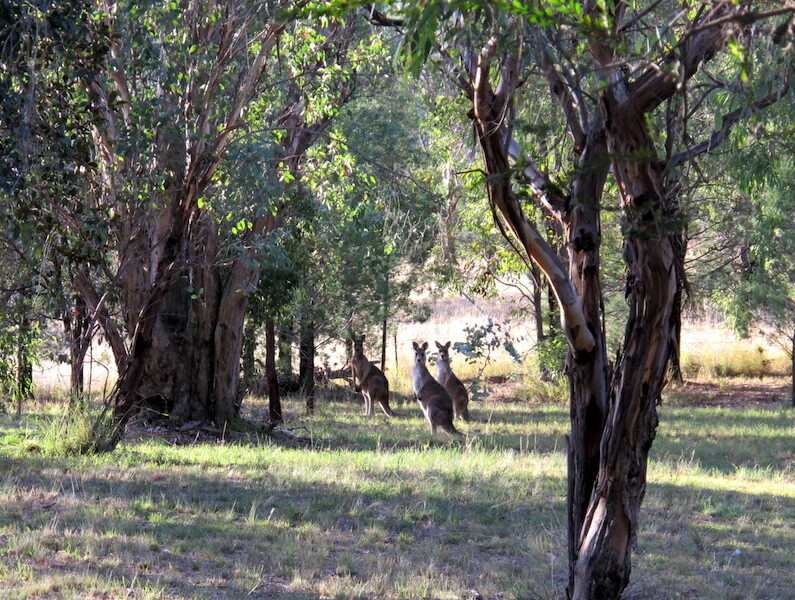 Following are two photographs showing our native friends, both photographs were taken from the deck at the front of our house. 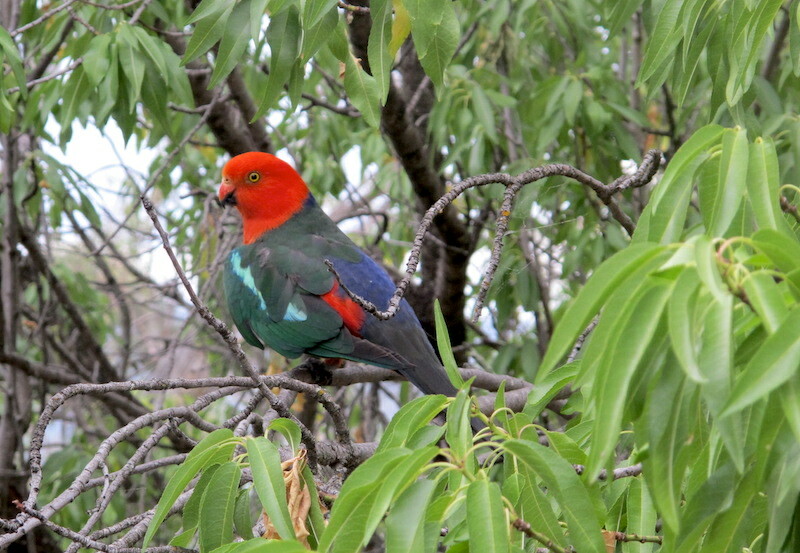 King parrots are a rather large bird, 43cm from the tip of the tail to beak end. They are not raucous, in fact they have a gentle personality moving through trees feeding quietly. We consider it a privilege to have them on our property. Our own parkland garden on our property near Tamworth. 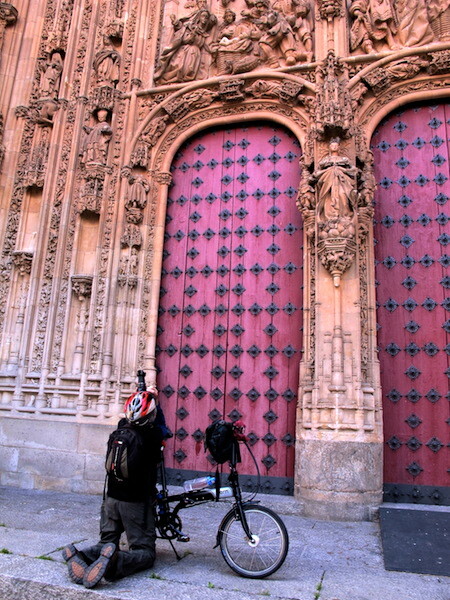 Before closing this post I would like to add my favorite photograph taken in Salamanca. I have labelled it, ‘Walking with Determination’. I heard a girl in the group ask an old man for directions, he attempted to explain without success then he said ‘come on and I will take you there’. It’s good to know old blokes have some uses. The reason I am drawn to this image is by association with my favorite American artist Norman Rockwell (1894-1978). Rockwell drew for a number of prominent magazines and often he would take a photograph of his subjects and paint from the photograph. To get a sense of forward movement he would place books under the heels and toes of his subjects. If in your mind, you place books under the heels and toes of the young folk and the old man in the above photograph you have the basis of a Norman Rockwell painting. The problem we all live with by Norman Rockwell. In reference to my previous statement about placing books under the heels and toes to achieve movement, do the same with the image above and you can understand why I thought about Norman Rockwell when taking the photograph of what I have called ‘Walking with Determination”. 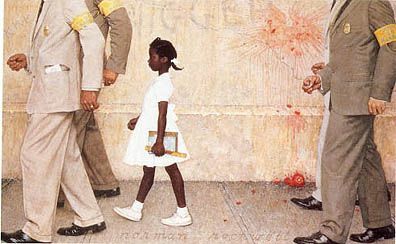 The Rockwell painting above relates to the deregulation of public schools in America. Young Ruby Bridges (6) was being escorted to school by government officials. It’s easy to imagine a book under Ruby’s right toe. 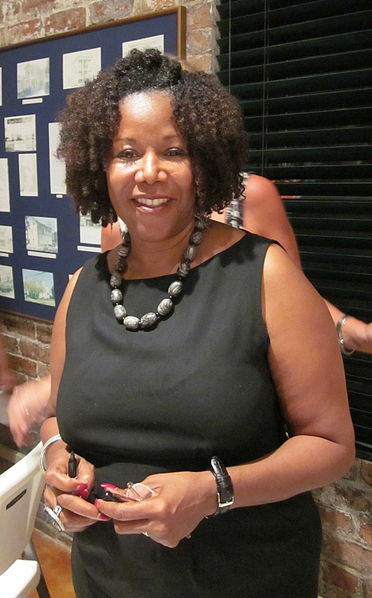 Below is a photo of the very brave Ruby Bridges in 2010. The brave Ruby Bridges 2010. Image credit: Infrogmation of New Orleans via Wikipedia. Copyright reference to the image of the Rockwell painting: According to Wikipedia from where the image is drawn the copyright is most likely owned by either the artist who produced the image, commissioned the work, or their heirs, however low resolution use is possible providing the use relates to artist technique. If any of the possible copyright owners see this image and do not agree I will take the image down immediately. During our travels fellow travellers who read our blog often ask me about the copyright situation. The previous copyright paragraph is for those who want to know what is sometimes involved. That’s the end of this post. We hope you have enjoyed travelling with us. The next post will relate to our stay in Lisbon, the capital of Portugal. Leave a comment and if you want to become a regular follower click on the Follow box.